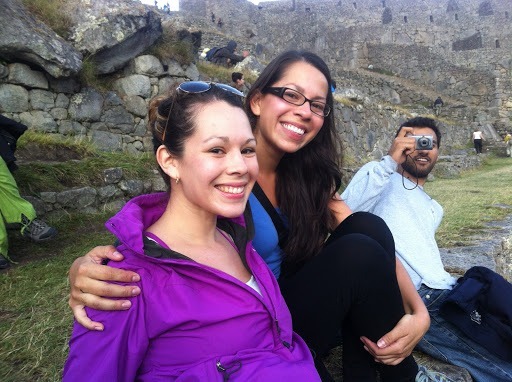 My sister arrived in Cuzco September 7th, and the three of us spent a few days bouncing around several hostels before booking our Machu Picchu trip. 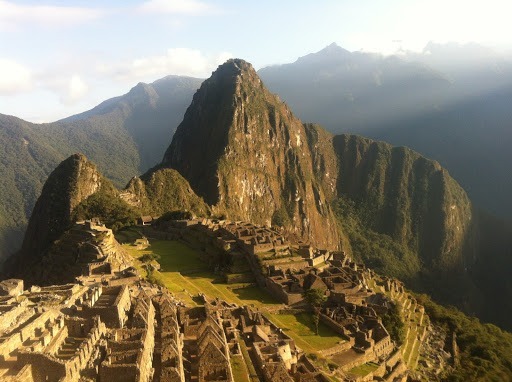 We knew going into it, that it was too late to book the Inca Trail… you have to do that month in advance. 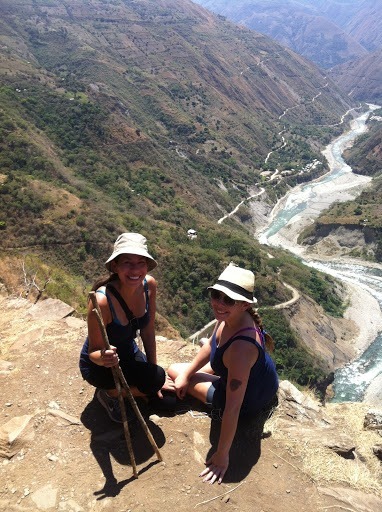 So it was between the Salkantay trek and the Inca Jungle Trek. We opted for the Jungle trek since it was jam-packed with more activities…rather than just hiking for 4 straight days. We booked the trip with Rasgos del Peru at Pariwana Hostel for about $200. Our tour guide was awesome, and we spent the next four days with some really cool new friends. Everyone met at the hostel in Cuzco at 7:30 am, three hours later we arrived at the point where the mountain biking would begin. Everyone strapped on their knee and elbow pads grabbed a helmet and picked out their bikes before we took off. The view down the mountain was absolutely incredible. I can´t remember how long the ride was…I´m guessing 3-4 hours, but it was very easy and only one person fell off the bike because he was trying to take a picture while riding. We arrived in Santa Maria at about 3:30 pm, ate lunch and changed into our bathing suits so we could go river rafting. I have to admit, I was a little nervous, but our instructor was very cool, and the fear washed away within a few minutes. The rafting costs $30 extra…but if you have never done it before, rafting in the Rio Urubamba is super cool and well worth it. We made our way back to the hostel just after the sunset, and we packed into the van soaking wet. I thought our room was a little dirty, but since it was already included in our tour, there really wasn´t much I could say or do about it. 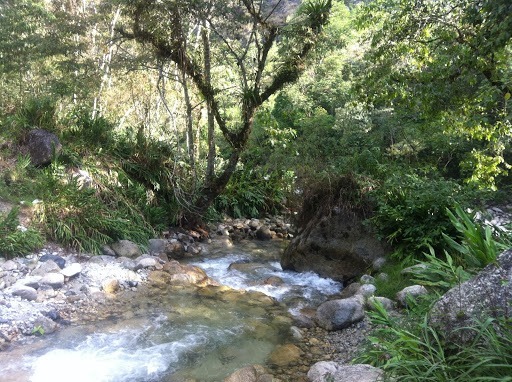 This was our trekking day… it was supposed to be an eight-hour trek to a town called Santa Theresa, but our group cheated, and after lunch, we cut the walk short and took a cab to the hot springs. The walk was a bit intense for my taste, but there were lots of places to stop and buy water and snacks. We walked by a Coca plantation and took several breaks to take pictures. Jumping into the hot springs was so relaxing after the long walk, and I was grateful Chris volunteered to take my stuff in his bag! Did I mention our group was awesome because they were! After breakfast, our groups separated and we went to two different mountains for zip lining. I paid $25 extra to have my heart skip a few beats before strapping onto the line. Chris has a fear of heights and at the last minute, decided he didn´t want to zip line on the six lines. My sister had done it before in Panama, so she was one of the first ones in the group to go. In the afternoon we ate lunch, drank beer and wine, and started walking along the railroad tracks to Aguas Calientes. It was an easy, flat walk, and we got to see Machu Picchu from afar. It was exciting to see a glimpse of a place I always knew I would see at some point in my life. After the three hour walk we settled into a hostel in Aguas Calientes, ate dinner, and went to bed early since our guide wanted to head to Macchu Pichu at 4:30 am. 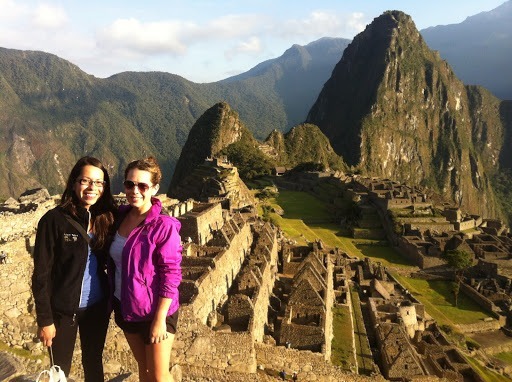 It´s tough to wake up so early in the morning, but when your walking to Machu Picchu, who cares! The walk up the mountains was brutal… I trailed behind everyone, but to be honest I thought I was going to pass out a few times. Chris ran up the stairs and forgot he had his passport in my bag. Our friend Jennifer told him it was best to get to the top before sunrise because there aren´t that many people inside Machu Picchu at that time. Unfortunately, he got stuck outside the gate because he didn´t have any identification or his ticket on him. He was not happy when he had to wait an hour for me. Oops! In the morning, the weather was perfect, and we walked around for a few hours before it started to rain. We stayed inside MP for about eight hours, I didn´t care about getting wet. I mean… when is the next time I´m going to be back there, ya know. I´m bummed my camera broke during the trek, but my sister took plenty of pics. That experience was so much fun, I would do it again in a heartbeat! So lovely! Thank you for posting this. Im planning to do the Jungle Trek as well, looks like you guys had a blast and it wasn't too intense (minus the 8 eight hours hiking). Thank you! Did you end up doing the Jungle Trek? That was one of the top experiences of my life!